The oldest candidate contesting the election to the 40-member Mizoram Assembly to be held on November 25 was the present Revenue Minister J H Rothuama (74) from Champhai North seat while the youngest candidate was Pazawna (27) of the BJP contesting from Mizoram-Tripura border Hachhek seat. According to the affidavits filed by the contesting candidates, the average age of the candidates of the three major parties - the Congress, Mizoram Democratic Alliance (MDA) and Zoram Nationalist Party (ZNP) was around 52. The average age of the 40 Congress candidates was 54 with Chalrosanga (39) contesting from Lunglei West against the Mizo National Front senior leader and former minister Dr R Lalthangliana, being the youngest ruling party nominee. The average age of opposition MDA, an alliance of the MNF, Mizoram People’s Conference (MPC) and Maraland Democratic Front (MDF), contesting 40 seats was 52 with two former ministers Tawnluia and R Tlanghmingthanga the oldest candidates at 70 years of age and the youngest candidate T C Kaphmingthanga at 34 years. ZNP, contesting 38 seats, has an average age of 50 with the eldest candidate being 72 and the youngest being 35 years of age. Political analysts said that the candidates in the Mizoram elections were younger as the popular mood was to have young and more dynamic leaders to rule the state. Polling party numbering around 100 officials, including 74 desk and seven nodal officers, on Sunday left for the six relief camps in the state to conduct polling for the Bru voters lodged there. Mizoram election department officials said that elaborate security arrangements were made for the polling officials as some members of the Mizo Students Union (MSU) reportedly were trying to obstruct the polling party from reaching the relief camps. The Election Commission instructed the state election department to make arrangements for Bru voters in Tripura to exercise franchise through postal ballots in their respective camps on November 19 and 20. Election to the 40-member Mizoram Assembly would be held on November 25 and the EC directed that arrangements should be made so that the Bru voters could cast their votes before November 25. Mizoram-Tripura border Mamit District SP Rodingliana Chawngthu told PTI over phone that around 45 MSU activists went to the border village of Kanhmun to make efforts to stop the polling party. Chawngthu said that he did not expect any problem as elaborate security arrangements were made to ensure the safe passage for the polling party. The MSU leaders said that they did not object to the exercise of franchise by Bru voters, but opposed the casting of votes outside the state. The Chief Election Commissioner V S Sampath recently clarified that the Bru voters were allowed to exercise franchise following a High Court order in 1999. There were 11,612 voters in the Bru relief camps belonging to three districts and spreading over nine assembly constituencies. 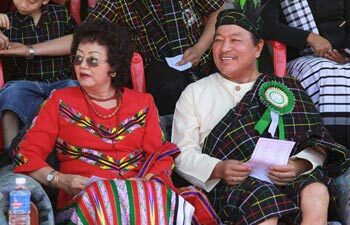 Mizoram Chief Minister Lal Thanhawla with his wife Lal Riliani. Elections to the Mizoram Assembly are scheduled for November 25. In an exclusive interview with India Today, Chief Minister Lal Thanhawla, who has ruled the state for four terms in the past, explains why he is confident of a fifth term. Q: What's your prediction of the November 25 Assembly Election results? A: I believe we will win in those seats where we failed in 2008. Q. You had a thumping majority of 32 in the 40-member House in 2008. Do you mean to say you will go past 32? A. Because we have delivered on our promises. Our flagship programme NLUP has not only improved agricultural produce and farmer's condition but also developed skill-sets and productivity of people in other sectors. Thanks to a transparent system, the Rs.1 lakh disbursed under NLUP has reached the beneficiaries. Another big success is the restarting of the 60 MW Tuirial Hydro Electric Project. Q. But your opposition says only Congress workers are getting NLUP benefits. And to woo votes benefits are extended to undeserving people. Even a barber has been given Rs.1 lakh just to start a small shop. People are using the money to buy mobile phones? A.There is a strong audit mechanism. Money is given over a period of a year in three installments, based on performance and utilisation. And a barber doesn't get Rs.1 lakh. I have now asked my officials to give them things in kind. Q. The youth of the state, in several opinion polls, have said that ZNP chief Lalduhawma is the best suited to become the chief minister. What's your reaction to that? A. Lalduhawma is a good orator and the impressionable minds get carried away with his impossible promises. But when it comes to voting, people choose the Congress. Q. How would you want to woo the youth? A. I don't need to woo them with false promises. I have already delivered. We have built three AstroTurf football ground, two AstroTurf hockey grounds and two floodlit sports grounds. Two more are in the pipeline. The number of educational scholarship holders is increasing and hundreds of youths are getting skill development training. The world belongs to the youth and my government's objective is to create opportunities for them. Q. The election mechanism in Mizoram is controlled by the church. The Mizoram People's Forum, a Synod-regulated body, has issued 27 codes of conduct. Why do you accept regulations from the non-government body when there is the Election Commission, a constitutional body, to hold elections? A. Because we want free and fair polls. Mizo society is by nature very disciplined. And the MPF codes don't come in conflict with EC guidelines. Q. There was a huge controversy over you sporting a tilak in Durga Puja in Kolkata. What's your comment? A. I don't want to comment on such a trivial issue. That shows the desperation of the Opposition. They don't really have an issue. Q. Why are you contesting from two constituencies? Are you not confident of your own victory? A. I have won six times from Serchhip and don't doubt my victory this time too. The local Congress members in Hrangturzo wanted me to contest from there because Congress has failed to win from that constituency earlier.